Update to the latest version to get the full user experience. Abbey Windows are proud to offer an array of integral blinds suitable for any property. Give your home a modern look with low maintenance. Low maintenance integral blinds for home improvement needs. Have you dreamed of a home where you have to spend forever cleaning the blinds in your uPVC windows, only to find they are dusty again? Abbey Windows have the ideal answer to your wish. We work with market-leading suppliers to provide our customers with high-quality integral blinds, guaranteed to save you time and money. Our range of stunning integral blinds come with high praise and are made from the best materials to provide you with heightened protection. Utilising the latest in technological advancements, you can benefit from the best in home improvement products, offering a simple, cost-effective solution to your window needs. We offer two types of integral blinds, one being Venetian blinds. Sandwiched between two panels of glass, your Venetian blinds provide the ultimate protection against harmful UV rays. This type of integral blind is ideal for those with conservatories, or vertical windows. As well as this, they are available to install into your existing window frames, making them perfect for any home. The other type of integral blinds offered to our customers is the pleated blind. Pleated blinds are ideal for those looking to increase their thermal protection, providing an extra layer that can be controlled by you. Working as protection for your windows, these integral blinds work to ensure your windows are not damaged by the weather over the years. To hear more about the range we offer, send us an email using our contact form. We will be happy to reply as soon as possible with detailed answers to your questions, giving you all the key information you require to make an informed decision. We can even give you a quote at the end to ensure you are being given the best price for your bespoke integral blinds. Alternatively, you can give us a ring on 0118 956 6866. Our team of trusted experts is on hand and ready to answer your call. They will be able to provide you with high-quality information and detailed, tailored advice best suited for your situation. At the end of your consultation, they will provide you with a quote that can be used as a starting point when you purchase your blinds. We are pleased to be able to offer you a range of flexible finance options to suit your budget. We are pleased to be able to offer you a range of flexible finance options to suit your budget. Choose our '5 Years Interest Free on our Harmony Range' or opt for our 'Buy Today with Nothing to pay for a whole year' option. With an extensive collection of finance options available, you can be sure to find the right option to suit your home improvement budget. Calculate which finance option best suits your budget by using our loan calculator. Alternatively, you can speak directly with one of our expertly trained team; we are always on hand to help with all your finance queries. Find out more about our finance options. Andy from Abbey Windows explains about integral blinds. Get in touch to get a free no-obligations quote from us and to hear more about the range on offer. Our range of stunning integral blinds is controlled by a variety of systems, meaning you can choose the one that will suit your home best. Our control systems utilise the latest technological advancements to ensure you are getting the best product for your home. Fitted as part of the integral blind unit, you will be able to use them immediately. This magnetic control c-system utilises magnetic forces with manual operation to ensure you are getting incredibly smooth functionality from your windows. Best suited for the Venetian blind, this system features two magnets, one external and one internal. The manual operation is made possible with the use of a cord loop that allows you to choose how much you open your integral blinds. If you like the idea of integral blinds but don’t want the cord to show, this is the ideal solution for you. The cordless slider SV system allows you to control the amount your blinds are open, much like the c-system, however it utilises a magnetic slider which is on a narrow slide guide. This means you are in complete control, with the help of this cleverly designed slider. Working best with pleated integral blinds, this system is ideal for those looking to incorporate integral blinds within their home, without the cord on show. To open the integral blinds, a magnetic device is positioned on the internal facing glass panel. The slider glides across the glass, travelling vertically to open your blinds, leaving you in complete control. Unlike the other systems in place, the w-swipe system is solar powered, which means it is a battery operated, motorised blind. Working best with either the Venetian or pleated blinds, this system allows you to control how and when your integral blinds are open. This is done using a control panel on the window itself, or via a remote control. Do your bit for the environment. This system has changed the way these integral blinds are opened, making it more efficient and more effective. The brushless motor opens and closes your integral blinds quietly to ensure you aren’t disturbed, suiting both Venetian and Pleated blinds. This means it allows for a safer opening and closing of your integral blinds, whilst leaving you in control. Innovative European design with revolutionary functionality. These windows are a must-have for the modern home. Our French Windows, a cousin of the French Door family, can truly open up your Reading home. Flush Casement Windows; a stylish alternative to the Casement Window offering slim sightlines with a flush outer profile. A traditional style uPVC window with the advantages of modern uPVC technology and functionality. Open up your living area with Abbey Windows' Bow and Bay Window installation service. Residence Collection Windows are a luxury brand of double glazed windows offering sophisticated and elegant style. We know that to make your house a home, you must feel comfortable and happy inside it – it’s an important factor. We also know that to achieve this, you need to regulate the temperature inside your home, giving you maximum comfort. Our work with one of our customers is proof that we offer a range of stunning products designed to do just that. Our customer’s home was prone to becoming uncomfortably hot in the summer months, rendering part of their house unusable. This meant that using iPads, tablets or TVs was a difficult task. They did not want to shut the light out completely, which is why they came to us for help with their problem. We were able to help them find the perfect solution. With their vision in mind, they knew they needed to install a set of blinds that suit their home, however, they did not want the mess of drilled holes into their walls. They decided to turn to us with the help of Abbey Conservatories to find them the perfect product to suit their needs. Browsing our range of stunning options, they were able to visualise the one that would look ideal inside their home. 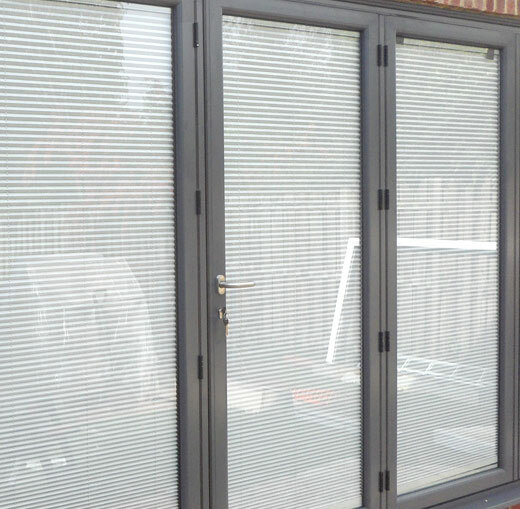 To achieve their goal, we were able to offer them a stunning range of integral blinds guaranteed to suit their home. Our integral blinds are designed to block out the harsh summer heat, whilst still ensuring your home is flooded with ample amounts of natural light. We have two ranges on offer that we allowed our customer to choose from – pleated and Venetian. The installation of their chosen white, pleated blinds was perfect for them because of its ability to make sure their home was dust free. Integral blinds sit within two panes of tough glass, making it low-maintenance and easy to use, ideal for this couple. As a result of this, it is quick and easy to install, providing immediate results and satisfaction. To find out more about how this success story, and others we have, get in touch with us today. Give us a call on 0118 958 2839 and talk to our experts today. We will be happy to provide you with the best products and services to suit your needs, giving you all the benefits at a reasonable price. Alternatively, send us an email using our online contact form or, if you know the product you desire, use our online quoting engine to get a realistic quote about how much your product will cost. Abbey Windows are double glazing experts, supplying thousands of homes in Reading and Berkshire with high-quality double glazing since our founders began trading in 1986. Making a payment to Abbey Windows could not be easier. Use our WorldPay form below or get in touch with us for alternative methods.